It takes 2 hours to take a bus from Dubai to Abu Dhabi. It’s a 90-minute drive. The Hyperloop could get you there in 12 minutes. The Hyperloop is a SpaceX technology for high-speed transportation in tubes from which most of the air has been sucked out. It involves reduced-pressure tubes in which pressurized capsules ride on an air cushion driven by linear induction motors and air compressors — a revolutionary technology which could make trains much faster. Hyperloop technology has been explicitly open-sourced by Musk and SpaceX, and others have been encouraged to take the ideas and further develop them. As a response to this, several companies attempting to implement this technology have emerged. Now, one of these companies, Hyperloop One, wants to build such a rail in an unlikely place: in the Middle East, connecting two of the biggest cities in the area. Their goal is to do this by 2020. 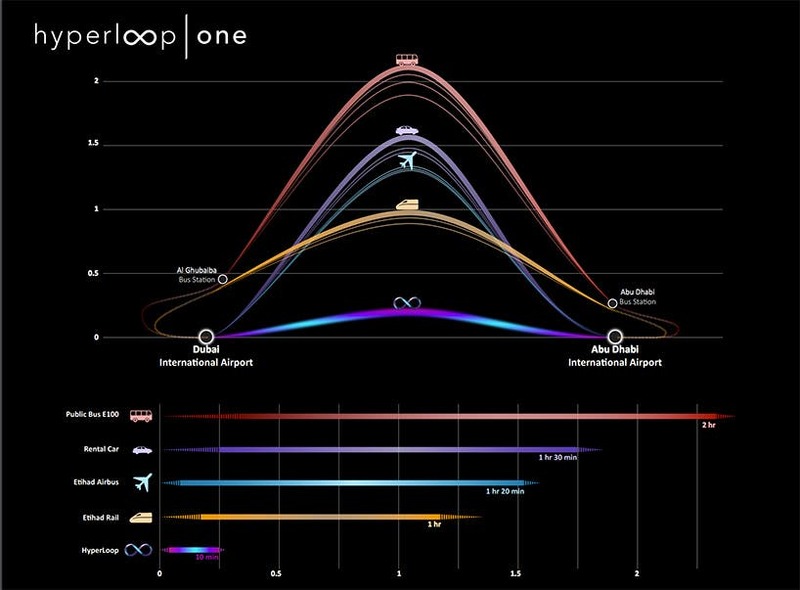 Hyperloop One outlined its plans with Dubai Roads and Transportation Authority (RTA) and they also released a feasibility study it’s conducting with McKinsey & Co. and the Bjarke Ingels Group, the company responsible for the design. It’s not a done deal yet, but it’s quite a proposal. The pods will be levitated on the rail in a Maglev-like technology and will be shot at 750 miles per hour, almost twice as fast as the world’s fastest existing train. It’s so fast that it would outpace even an airplane – easily. It currently takes one and half hours of driving to get from Dubai to Abu Dhabi, and with a plane, you could do it in just over an hour. The Hyperloop system would do it in 12 minutes and for only a fraction of the cost (barring infrastructure costs). This would save not only a lot of time but also a lot of money. The presentation video also claims that journey times between Dubai and Riyadh could be cut to 48 minutes, while a trip from Dubai to Doha could take just 23 minutes, hinting at a larger emerging network. With several countries already expressing interest for Hyperloop technology, we may be in for some interesting developments.